Since forming in 2006, Presidio Brass has rocketed to success, representing a bold new generation in brass entertainment. Combining brass quintet with piano and percussion instruments and employing fresh, original arrangements, their unique sound has become a trademark for the ensemble, captivating audiences everywhere. The five-member ensemble from San Diego, California features trumpeters Steve O’Connor and Miles McAllister, Josh Bledsoe and Geoff Durbin on trombone, and tuba player Mike Frasier. One common bond of these individual performers is that each member began his music career in school band. The inspiration provided by the dedicated school music educators that they encountered brought them together with the primary mission to promote music education and music appreciation. Knowing the profound impact that music has on lives, Presidio Brass couples master classes and other school programs with their performances at every opportunity. Upcoming educational events featuring the talented quintet include appearances at Disney’s Thanksgiving Day Parade of Bands, the National Association for Music Education Conference, the Midwest Clinic in Chicago, and an event at KHS World Headquarters in Taipei. They look forward to their inaugural performances on XO Brass instruments. Presidio Brass concerts have been enjoyed internationally, with performances and educational outreach programs throughout North America and China. 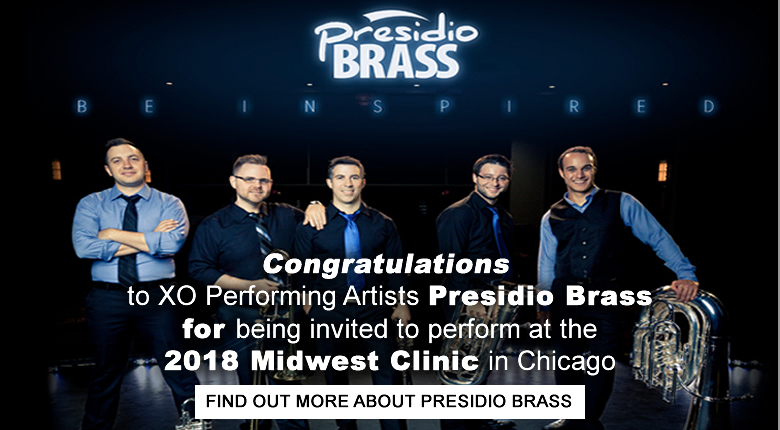 Presidio Brass has performed in over 40 states, conducted master classes at many of America’s finest colleges and universities and have been featured on National Public Radio. The 2018 season will feature a brass quintet composition contest sponsored by the KHS America Academic Alliance. The winning student composer will receive a concert at their school and have their piece premiered by Presidio Brass.